A Husky and German Shepherd dog rehoming charity has recently been set up, using its founder’s heroic canine pet as its inspiration. When Zoe Quinlan and Faye Bailey came up with the idea of raising money for charity with the help of their dogs, little did they know that many local residents of Goole, East Riding of Yorskhire would join in. The world famous Iditarod Trail Sled Dog race got underway in Willow Lake, near Anchorage, Alaska on Saturday. 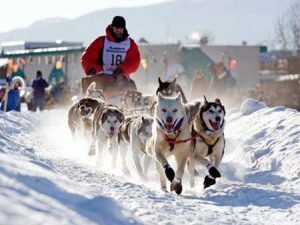 Mushers from far afield as New Zealand, Jamaica and Scotland gathered to take part in the gruelling event, and more than 60 drivers and over 900 dogs were sent on their way by hundreds of spectators as they set off in two minute intervals. Archaeologists have discovered the remains of a dog buried thousands of years ago which indicates that people at the time viewed dogs as fully thinking, social entities rather than as pets. Although some dog owners are criticised for treating their pet like a human for indulging them with luxurious food, dog toys and expensive dog collars, it seems that they were not much different from their ancient ancestors. Dog lovers in British Columbia have been left aghast at the news that more than 100 sled dogs were butchered in April of 2010. The dogs belonged to a Californian sled dog business called Outdoor Adventures that ran into financial difficulties shortly after the Winter Olympics, which were held in Vancouver. Now, the Royal Canadian Mounted Police (RCMP) have launched an investigation into the cull. 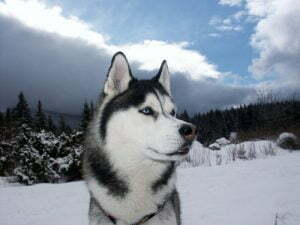 The Siberian Husky is a working dog that originated in the cold, harsh environment of eastern Siberia, Russia. It was bred by the Chukchi, an indigenous tribe that lived by the Bering Sea. This handsome dog is easily recognised by its distinctive markings; a dense double coat, triangular ears and standout facial markings. It is a hardy, energetic breed and was introduced to Alaska during the Nome Gold Rush, after which it spread to the rest of the United States and Canada. They originally were put to use as sled dogs, but are now mostly kept as show dogs and family pets.